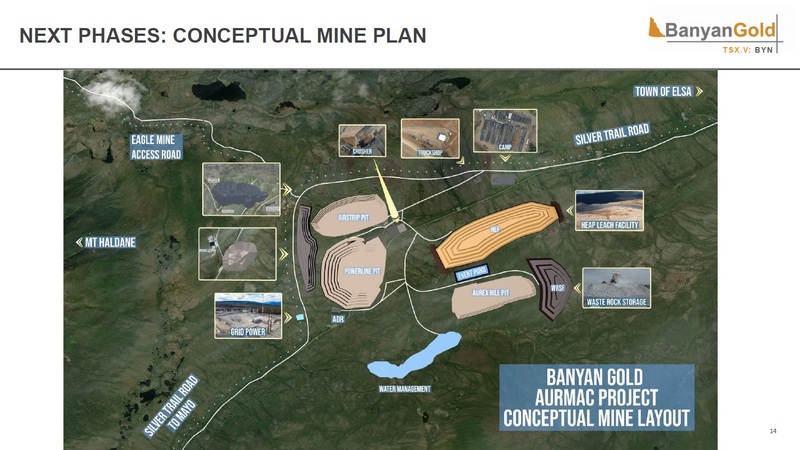 Banyan Gold Corp. is a well-financed growth stage gold exploration company, focused on advancing two Yukon gold properties, the flagship Hyland Gold Project and the Aurex-McQuesten Gold Project. The Hyland Gold Project has a current NI 43-101 Indicated Mineral Resource of 8.6 million tonnes grading 0.85 g/t gold equivalent (AuEq) for 236,000 AuEq ounces with an Inferred Mineral Resource of 10.8 million tonnes grading 0.83 g/t AuEq for 288,000 AuEq ounces at a 0.3 g/t AuEq cut-off. This resource is located in its entirety on what is known as the “Main Zone”, is open in all directions and at depth, and has the potential to host a multi-million ounce deposit. Strategic Partnership with Alexco Resource Corp. and Victoria Gold Corp. 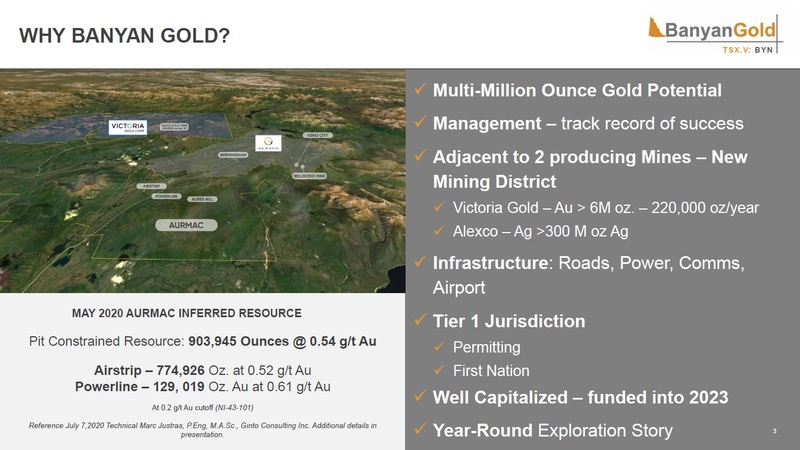 The 100% owned flagship Hyland Gold Project is located in the Watson Lake Mining District in southeast Yukon, approximately 70 kilometres northeast of Watson Lake, along the southeast end of the Tintina Gold Belt. The Project covers over 18,620 hectares in area that is currently accessible by vehicles on a winter road from Watson Lake. The Hyland Gold project consists of the Main Zone, Camp Zone, Cuz Zone, and Montrose Ridge Zone that extends over 11 kilometres. The Hyland Main Zone has a current NI 43-101 Indicated Mineral Resource of 8.6 million tonnes grading 0.85 g/t gold equivalent (AuEq) for 236,000 AuEq ounces with an Inferred Mineral Resource of 10.8 million tonnes grading 0.83 g/t AuEq for 288,000 AuEq ounces at a 0.3 g/t AuEq cut-off (effective date March 22, 2018). 6 metres of 1.15 g/t Au and 16.23 g/t Ag in TR17-06B. 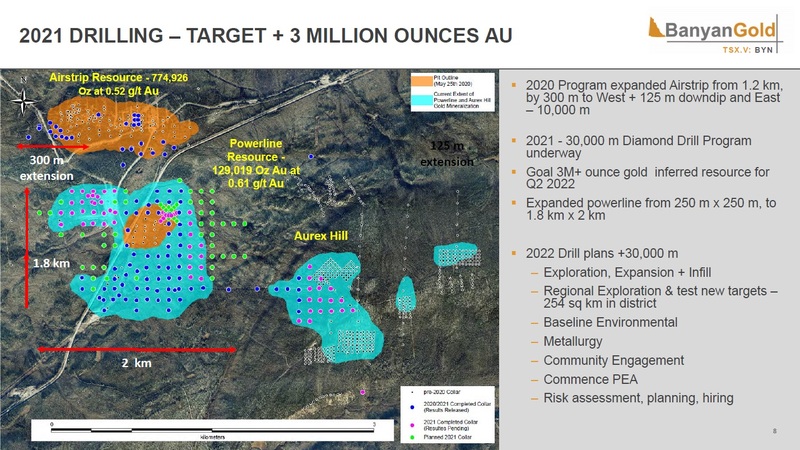 The 9,230 ha Aurex-McQuesten Property, in close proximity to Victoria Gold's Eagle Project and Alexco Resource's Keno Hill Silver District, is highly prospective for structurally controlled, intrusion related gold-silver mineralization. 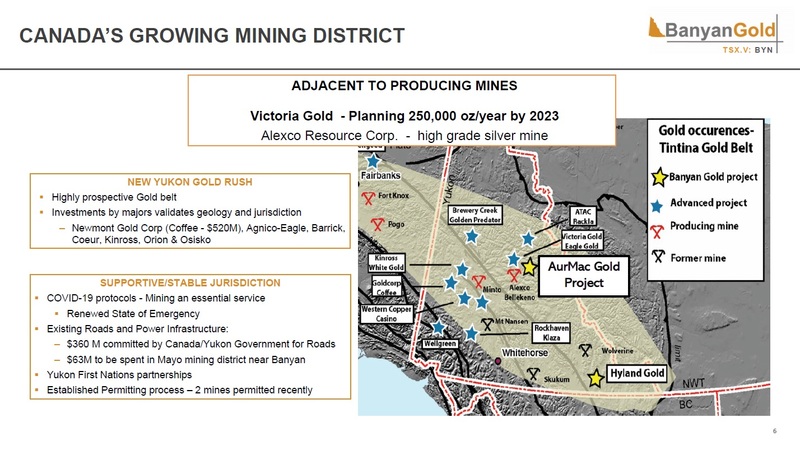 Additionally, both Victoria Gold Corp. and Alexco Resource Corp. are strategic partners on this project, providing camp, geological and financial support. Aurex Project acquired from Victoria Gold Corp.
McQuesten acquired from Alexco Resource Corp.
Ms. Christie has over 20 years' experience in the exploration and mining business. She is the President of KECM Services, and was President of Gimlex Gold Mines Ltd. She has been a member of the Board of Directors of Constantine Metal Resources Ltd. since July 2006. Ms. Christie is also a board member of PDAC and was a founding board member of the Yukon Environmental and Socio-Economic Assessment Board. Mr. Rutt has over 27 years financial industry experience. Mr. Rutt is Chief Financial Officer of Stratus Aeronautics. Mr. Rutt was the Secretary-Treasurer of Landis Energy, and was the Chief Financial Officer of Landis Energy. Mr. Gray has over 20 years mineral exploration experience. Mr. Gray has worked extensively as an exploration geologist in the Mineral Exploration Industry in Canada, the United States, Asia and Central and South America for the past 17 years. Mr. Gray has been working in the Yukon and North West Territories with advanced gold exploration projects since 2004. Mr. Aryanto has over 15 years' project development experience including ten years' experience working in the Yukon. Please refer to Banyan's website www.banyangold.com for complete biographies. On October 24, 2018, Banyan Gold Corp. has released analytical results from the first four holes of the recently completed 12-hole diamond drill campaign on the Aurex-McQuesten property, central Yukon. Drill Hole MQ-18-30 returns 70.7 m of 1.06 g/t Au, including 15.1 meters of 3.05 g/t Au. On September 19, 2018, Banyan Gold Corp. has released the results from the 2018 11-diamond-drill-hole program at its 100-per-cent-owned Hyland gold project in Yukon. Banyan extends Main Zone Mineralization by 1.25 km at Hyland Gold Project. 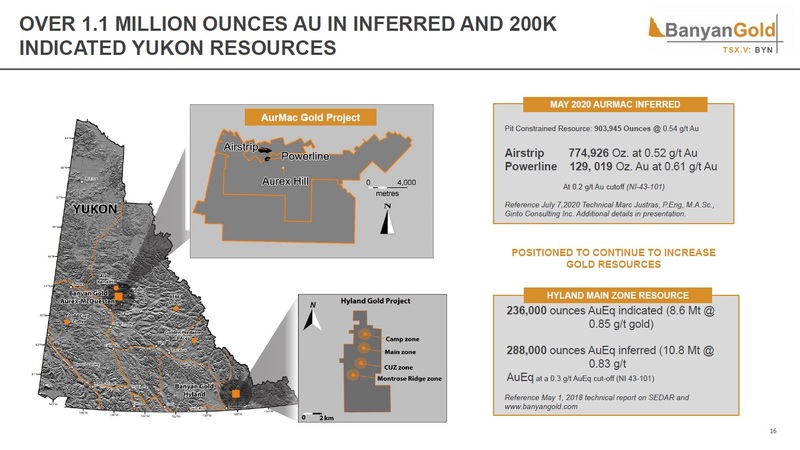 85.0 metres of 0.73 g/t Au and 5.61 g/t Ag from surface in HY18-077 including 1.52 metres of 14.5 g/t Au and 51.8 g/t Au from 61 m.
On June 18, 2018, Banyan Gold Corp. has commenced the 2018 field exploration season, with field-based trenching, diamond drilling and geochemical sampling programs planned for the Company's wholly owned, flagship Hyland gold project located in Yukon. On May 02, 2018, Banyan Gold Corp. files N.I. 43-101 technical report on updated mineral resource estimate for the manin zone, Hyland gold property, Yukon Territory. The indicated gold resource estimate contains 8.6 million tonnes grading 0.85 gram per tonne gold equivalent for 236,000 gold equivalent ounces with an inferred mineral resource of 10.8 million tonnes grading 0.83 gram per tonne gold equivalent for 288,000 gold equivalent ounces at a 0.3-gram-per-tonne-gold-equivalent cut-off. On April 18, 2018, Subject to regulatory approval, Banyan Gold Corp. has retained Independent Trading Group Inc. (ITG) to provide market maintenance services to the company in compliance with the policies and guidelines of the TSX Venture Exchange and other applicable legislation. On March 22, 2018, Banyan Gold Corp. announced an updated NI 43-101 mineral resource estimate on the Main Zone at its Hyland gold project. Hyland's Indicated Mineral Resource has increased to 8.6 million tonnes grading 0.85 g/t gold equivalent (“AuEq”) for 236,000 AuEq ounces with an Inferred Mineral Resource of 10.8 million tonnes grading 0.83 g/t AuEq for 288,000 AuEq ounces at a 0.3 g/t AuEq cut-off. On March 13, 2018, Banyan Gold Corp. reported 86% average gold recoveries from finalized Hyland Gold Project Main Zone column leach tests. 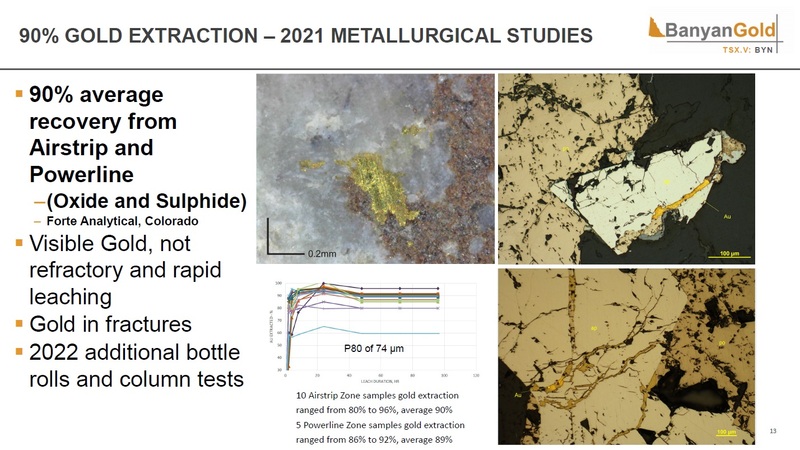 The test work also demonstrated strong leaching kinetics with a range of 73-87%, demonstrate the main zone is potentially amenable to an open-pit, heap-leach-style processing method.